The Country Inn & Suites, Clarksville, TN provides modern meeting rooms with eye-catching decor for your next business conference or social event. 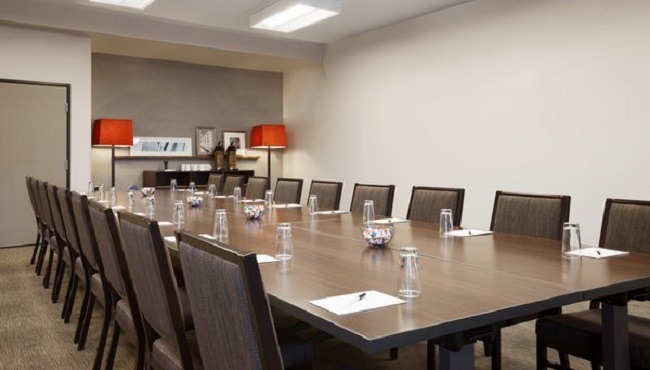 Choose the boardroom for events of up to 10 people, or pick the large meeting room when you’re hosting up to 85 people. We also have a small meeting room that accommodates 30. Traveling with a team? Check out the group discounts offered with our Sports Approved Program. Contact our professional staff today to start planning your trip! If you need a small space for an interview or a high-level meeting, our boardroom is the perfect fit. Hold a bridal shower or a corporate function in our Small Meeting Room. Allow our professional staff to assist you with the details. Looking for an event space to host a cocktail party or a family reunion? Reserve our Large Meeting Room for your next big gathering.